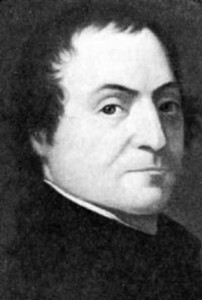 William Williams was born in Lebanon, Connecticut, on April 18, 1731, the son of Pastor Solomon Williams, D.D., and Mary Porter Williams. Great-great grandfather Robert Williams was born at Great Yarmouth, England about 1593, emigrated to America from Norwich in 1637 and settled at Roxbury, in Massachusetts. William’s father, Solomon, and his namesake grandfather, William, both went to Harvard College and were ministers of the gospel. His father was for some fifty years the Pastor of the Congregationalist church in Lebanon. Mary Porter, William’s mother, was the daughter of Samuel Porter who was baptized at Felsted, County Essex, England, and died at Hadley, Massachusetts in 1689. Mary was descended from a John de Forde of Abbey Field, who died in 1315. In view of the Harvard legacy of his father and grandfather, it should be no surprise to learn that William, too, enrolled at Harvard College at age 16, graduated at 20 with honorable distinction, and commenced theological studies with his father. His plan for life was to follow his father in Christian ministry. The French and Indian Wars (1754-1763) interrupted this when he enlisted in the Continental Army. He joined his uncle, Colonel Ephraim Williams, and accompanied a British military expedition to Lake George in northeastern New York. On September 8, 1755, at Rocky Brook, four miles from Lake George, British Major General William Johnson, leading 1,200 provincial troops, engaged Monsieur le Baron de Dieskau in a fierce battle. Colonel Ephraim Williams commanded a regiment of provincial troops, and at the first volley was shot through the head. William returned home after this wartime experience with a feeling of contempt for the British officers in general, who were haughty and who openly regarded the colonists as inferior men. He put aside the idea of further religious study, opened a store in Lebanon, and prospered as a merchant. At age 25, he was elected Town Clerk (1752-1796), the beginning of a long political career holding local, provincial and State offices. He was a Lebanon selectman (1760-1785), and was soon thereafter chosen a member of the Connecticut Assembly, and for forty-five years he held a seat there. He held a number of official positions in the Assembly, including that of Speaker of the lower house (1755-1776); in his later years he was named Judge of Windham County Court (1776-1805) and Probate Judge for the Windham District (1775-1809). On February 14,1771, and almost 40, Williams was married in Lebanon to Mary Trumbull, age 25. She was the daughter of Royal Governor Jonathan and Faith (Robinson) Trumbull. Her family tree showed her related to John Adams, Oliver Wolcott, and to the first wife of William Ellery. Governor Trumbull’s life to that point had been somewhat similar to his new son-in-law, William. He too was studying to prepare for the ministry, but family difficulties required him to enter his father’s mercantile business. He studied law and was sent to the General Assembly, where he held posts under the royal governor for some years, became the Chief Justice of the Supreme Court, and then became the Royal Governor in 1769, keeping the job of Governor, despite the revolution, until 1784. Mary Williams’ brother, John Trumbull, became famous as a painter of the Revolution. His works include the portrait above of William Williams, and the four large paintings of the Revolution now hanging in the Rotunda of the U. S. Capitol. Mary and William had three children, Solomon, born 1772; Faith, 1774; and William Trumbull, 1777. Mary’s brother, John Trumbull, became famous as a painter of the Revolution. His works include the portrait above of William Williams, and the four large paintings of the Revolution now hanging in the Rotunda of the U. S. Capitol. William became an ardent supporter of the proposition for Independence, and gave his support financially through his own purse as well as through many effective writings. Williams presented the claims of the colonists in the press, and helped compose many of the Revolutionary state papers of the Royal Governor Jonathon Trumbull. During the 1760s he served on committees that considered the Stamp Act, the Connecticut claims to the Susquehanna lands, the case of the Mohegan Indians, and settlement of the boundary disputes between Connecticut and Massachusetts. Williams served as a Colonel in the Connecticut Militia (1773-75), but he was also the son-in-law of the Royal Governor! Governor Trumbull was the only royal governor to support the revolution. In 1775 William went from house to house soliciting private donations to defray the cost of sending Connecticut troops to aid in the capture of Ticonderoga. The Connecticut Assembly appointed Williams a delegate to the 2d Continental Congress in June, 1776, to take the place of Oliver Wolcott, who had become ill and had to return to Connecticut. Williams’ letter to Wolcott dated August 12, 1776, said that he did not arrive in Philadelphia until â€œnear the last of July, after the most Sultry & fatiqueing journey I ever performed, by much. The City has been since I came & yet is the most uncomfortable Place that I ever saw …, his language confirming the extreme heat and humidity attributed to Philadelphia at the time of the Declaration deliberations. Williams did not arrive in time to take part in the debates for Independence in Congress, nor was he present to cast a vote for the Declaration. His timing did permit him to sign that parchment in August when most of the other delegates did so. After Williams arrival in Philadelphia, he found the activities of the Continental Congress and its Committees involved in what today may sound somewhat familiar. His letter home to brother-in-law Joseph Trumbull on August 10, 1776, was totally about the politics involved in the appointments to Army rank . . .On the repeated Request of Genll Washington for an additional number of Major & Brigadier Generals, & representing the necessity of them to assist in the Command in a day of Action, which he is expecting, Congress yesterday took up the matter, & have appointed a number of each sufficiently large viz … and listed a number of such appointees. But the list excluded …Poor Wooster, a worthy Officer is neglected boundless Efforts have been used to blast his Character in Congress … as a most worthless contemptible Felon & the most liberal abuse thrown out against him … such as I think totally inconsistent with (his) Honor & Justice to suffer, but so it is… No doubt Wooster had connections with the Trumbull family. In 1779 Williams accepted worthless paper money in exchange for $2,000 in coin for military supplies. He was said to have remarked that if independence were established he would get his money back; if not, the loss would be of no account to him. Some had criticized Williams for resigning his colonelcy of the 12th Militia Regiment at the outbreak of the Revolution in order to accept the election to the Continental Congress. His courage, however, was evidenced in 1781, when word arrived in Lebanon of the traitor Benedict Arnold’s raid upon New London. He immediately mounted his horse and rode twenty-three miles in three hours to offer his services as a volunteer. On arrival the town was already in flames. In the winter of 1781, while a French regiment was stationed in Lebanon, Williams moved out of his home and turned it over to French officers. Williams was a delegate to the convention which adopted the Articles of Confederation, and then again in 1788 he was a delegate to the ratifying convention at Hartford to consider the adoption by Connecticut of the Constitution of the United States. He voted for it, but objected to the clause forbidding religious tests. His later years were spent as a county judge. In 1810 his eldest son, Solomon, died, and he never seemed to be able to get over the loss. With rapidly declining health, the old patriarch died at 81 on August 2, 1811. Interment was in the Trumbull Cemetery, about a mile east of the town of Lebanon. In Washington, D.C, on the north side of the mall near the George Washington monument, there is a small park and lagoon celebrating the signers of the Declaration of Independence. One of the 56 granite blocks there is engraved with the name of William Williams. 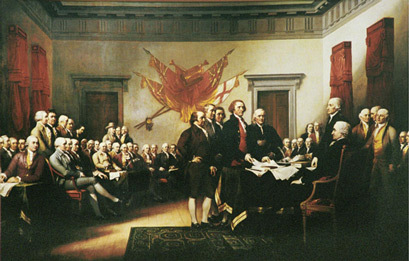 In the Rotunda of the U.S. Capitol hangs the famous Trumbull painting â€œThe Declaration of Independence.â€ William Williams is shown standing on the right at the back of the room in a group of two, with a brown coat. Next to him, on the right in a red coat, is Oliver Wolcott. This entry was posted in Connecticut, Signers by state. Bookmark the permalink.